I never written much about my life with our government forced saving account, our CPF system. 2 weeks ago, one of the reader’s question about how his CPF would compound, reminded me about this. So why not I just write something so that you can have a coherent idea about my life with CPF. If you are a young working adult, you can take a look at how uncle Kyith does things. They are not always the best way, but I hope this puts some questions in your head to learn more about your future interactions with CPF. For those that are working, have a family, I hope my case study shows a part of the other side of the fence. I do plan on adding on and updating this article, so you are likely to see future updates. This is because your goals, philosophy and plans do change, and that is normal. If you have any feedbacks, things that you are unclear, I will try my best to clarify (that means I might not reveal everything), by commenting below or send me an email. But likely, you won’t find many that have this profile. The Average Singaporean profile tends to be married, and majority of their CPF OA are used to finance mortgages. They need to manage the situation where the CPF needs to both finance their dwelling and also their retirement. So reading this case study might not always be very helpful for you as the CPF member who is single and do not own property is rather niche. This is not too much of a problem because it is likely no 2 CPF member’s situation is exactly the same. However, some of my ramblings and axioms of the CPF system might give you enough things to ponder about how you live your life with the CPF. Each of us have 3 to 4 accounts in our CPF. Before age 55 we will have the CPF Special Account (SA), CPF Ordinary Account (OA), CPF Medisave (MA) that we contribute to. At age 55, our money from CPF SA and CPF OA will be transferred to CPF Retirement Account (RA), which will grow and fund our national annuity scheme CPF Life. Since I am 37, and below 55, I have only the 3 accounts. Currently, if you choose to make the decision to invest your CPF OA to grow your money, You can open a CPF Investment Schemes (IS) account with either OCBC, DBS and UOB. Stuff is meant to satisfy purposes. As there is no set path, as compared with folks with a family, some strategies if performed might be detrimental in the future. If you are uncertain about things, you need more flexibility, and flexibility often is not cheap. In order to figure out whether something is useful to serve our needs, we have to seek to understand it. As we understand it better, we have to understand, to a good level, what are our goals in life, or the possible future goals in life. Then we can work upon how we use something to satisfy our goals. The CPF is a many head Hydra. It is not 3 different accounts, but 3 different accounts that tries to serve many roles. This can be for children’s education, retirement, service mortgage and healthcare needs. There are numerous strategies CPF advocate you to do, such as top up, transfer to your spouse, parents. There are no one best strategy. There are only strategies that fits your situation the closest. You have to know what you need, what you don’t need so that you can identify how you should use the CPF. Take the CPF and make someone who is close to your life better. With that in mind, let us go through some of the decisions that I made in the past, may make going forward. There are 2 bodies in Singapore that are able to show how much wealth pass through our hands, or how much we could accumulated. They are IRAS and CPF. And they could choose to drive home an important personal finance lesson but currently they have failed to. Our CPF statements have gotten more fanciful, but perhaps, can’t they show a line graph of how much we have accumulated over a span of 13 years? It will be a good teaching apparatus for parents to show their kids next time the importance of saving. My answer to that is that firstly, I do not know if that is a lot of money, because who the hell spends their waking hour thinking about their CPF. Secondly, I also dunno about my accumulation journey because when I need it, I realize I cannot find the back dated CPF statements any more. So even if I want to show you today (likely not else I will be violating some HR policies), I couldn’t show you the virtues of saving. By doing a transfer to CPF SA, I would have favor a conservative higher return over flexibility. 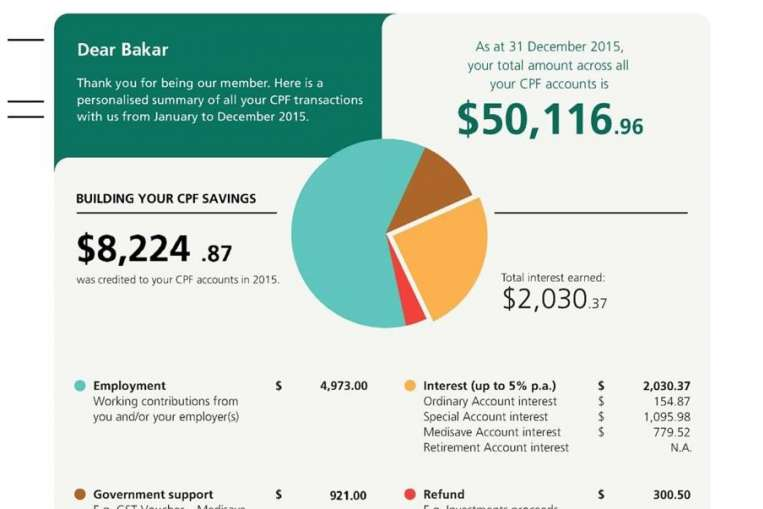 If the majority of the money is in my CPF SA, my money earns 1.5% more in interest than currently. My stance here is that I favor flexibility over a conservative higher return. I have written about my stance when I give 6 Reasons not to Voluntary Top Up your CPF Special Account with Cash or CPF Ordinary Account. Working in so many projects, where so many Murphy’s law takes place, despite our best planning, I cannot fathom why people are so confident that everything will fall according to plan. The only plausible reason is that they have more spare cash to act as emergency buffer should they need to. In this case, instead of using the untouchable 2.5% CPF OA as a mortgage buffer, they rely on the 0% cash or 6% investment assets as mortgage buffer. Either way, some buffer have to be kept. Why Not Get a HDB Resale Flat? Being surrounded by savvy friends (one of the perks of being a financial blogger is that you have no shortage of people who are good with financial numbers), they have a way to make me look like the stupidest >35 year old single who is unwilling to get a resale HDB property. To be clear, its not that I will never get a HDB flat. I may stop work in 2 years time. So I won’t take on mortgage. The only possibility is to rent out this current 5 room to pay for the mortgage of the new resale HDB (due to #3 this is likely not going to happen). I could perhaps work 3 years and channel $60,000/yr to pay off the mortgage. So that is a lot of reasons/excuses not to buy one. You might want to advise me why I am wrong here and convince me otherwise. So if I do not transfer from OA to SA, and I didn’t get a property, then likely my CPF returns are not well optimized. To me, you got to live with that. Can a less than optimized CPF be useful to me? I believe so. The key is that we try to work within our constrains, our personality and try to do the best within these restrictions. For example, if some of these intangible constrains to move away from the current flat were to be removed, then I should try my best to consider buying another flat and renting this one out. I could also work on my laziness to manage another property. If I do more fundamentally sound things with my CPF monies, than the wrong kind of things, I believe that is more critical than the rate of return. Slightly off topic, I often have the “WOW” factor when I realize how much my friend’s net worth could be after their HDB flat appreciate in value. Often, I only realize later that as a single, your net worth is the family’s entire net worth, for a couple is 2 person. I am basically stacking 1 person’s performance versus 2 person. However, when it comes to housing and CPF, when you sell your home, the CPF only keeps your contribution to the home AND the amount of accrual interest on your CPF OA you could have earned during this time. Since you get to keep the residual realized gain as cash, the CPF of 2 person, when viewed individually, tends to be no different from a single. Even more off topic, the price differential of a BTO in the same area from the resale price could be $200,000 to $250,000. Since I did not have a mortgage, I ended as those rare people that can put my CPF into investments. Many would aim to beat the CPF OA rate of 2.5%, or to match up to the opportunity cost of not transferring to the CPF SA and earn 1.5% more. I aim for somewhere in between, which is to achieve a better rate of return, with low management effort. So what can we invest in with our CPF OA? I have provided a column to indicate if I have dabble in those financial assets. I have already have experience in unit trust, ETF, shares, REITs, Gold ETF. I am open to exploring annuities, insurance endowments, Singapore Government Bonds, fixed deposits. Why would I consider them if the yield is so low? If I say they are under consideration, it is because they may not remain low always. We all like to extrapolate that what happened in the past 15 years is what will happen in the next 30 years. The government have said that the CPF OA rates is pegged to the 3-month average of major local banks’ interest rates, or 2.5%, whichever is higher. If we have the SGS Bond rates consistently above 3.5%, this would mean likely insurance endowment rates to be greater than 2.5%. The table above shows my current CPF OA allocation. The blended rate of return over the long run is 3.64%. That is not as high as CPF SA. But it is likely because I am rather passive about it and didn’t push the CPF OA hard. The unit trust returns in the future are likely to not achieve so much, but in terms of individual stocks and REITs, that return is possible. 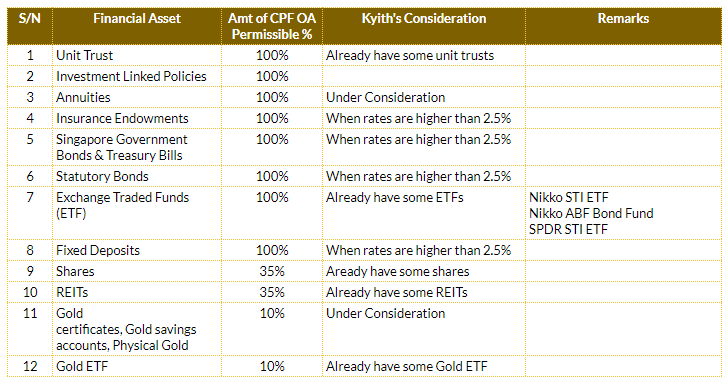 The table above shows an allocation where I wish my CPF OA to be in the near term. There will be more allocation to individual stocks, REITs and ETF. The strategy is to take a value approach to purchase and hold financial assets. Ensure that each component have a positive expected return. Manage the financial assets from a portfolio perspective. There is a narrative that you cannot beat the safe conservative returns of the CPF OA. The CPF SA returns is such a high hurdle to overcome. To reinforced that narrative, we have articles that state most people lost money on their CPF (like 40%) and couldn’t beat the 2.5%. Only this year, the metrics of measurement was changed and they reported that for the 12 months, most CPF IS investors made money. So should we invest or not invest our CPF? I feel that looking for the best way to optimize your CPF returns is important, but the dangerous narrative is to create that helplessness that you cannot beat a 2.5% return. Do you only depend on your CPF for your retirement and wealth needs? If you aren’t, then what are you doing with your money, outside of CPF? Were you able to beat 2.5%? Most likely, you are trying your best to get a good risk adjusted rate of return. Some people are able to do it in their wealth building, some couldn’t. The fact is, if you need to build wealth, you got to developed that competency, systems, knowledge & wisdom for it. Regardless whether its CPF or your personal money. The danger narrative here is that there is no other choice but that safe 2.5%. And this helplessness is not helping Singaporean’s wealth building. Most do not developed that competency and the alternative is either properties or fixed deposits. Sustainable wealth building requires the willingness to learn, and execute, make mistakes in order to get better. If you develop this nanny mentality that nothing beats 2.5% and 4%, be prepared when you want people to build wealth on their own, they couldn’t. One of the reason why I am rather passive over optimization of the CPF is that goal posts do shift. And in the next few years, it is likely there are changes to the CPF Investment Scheme. This may restrict the number of things we could invest in with our CPF, or things could be the same. When the CPF Advisory Panel reviewed the CPF after the Roy Nerng debacle, one of the recommendations was that the CPF Investment Scheme needs to be reviewed. Changes to the CPF won’t take place so fast but I wouldn’t be surprise some quantitative investment platform gets license to offer some exchange traded fund solutions. I won’t be surprised if Vanguard, Blackrock or Dimensional Fund Advisers edge in with their low cost index fund portfolio offering as well. If I reduce my work income in 1.5 years time, my CPF contribution also gets reduced. 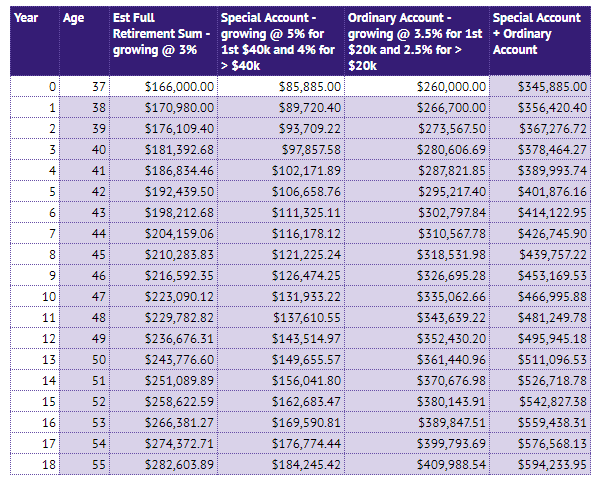 The question is whether I will be able to hit the future Full Retirement Sum (FRS) at age 55. Turns out 55 years old is not so far away! It is just 17 short years. Since I do not have a property to pledged, I cannot just satisfy the Basic Retirement Sum (BRS), which is half of the FRS). I will have the option of contributing more into the CPF Retirement Account to hit the Enhanced Retirement Sum (ERS). That is 1.5 times the FRS. The FRS is now $166,000. The table above shows the projected growth of the CPF FRS, and my CPF OA and SA account without any further contribution. In 18 years time, the FRS may be around $282,603, the ERS around $423,904. My current CPF OA + SA of $345,885 already met the future FRS, but not the future ERS. Based on the growth of the CPF SA and OA conservatively, the CPF SA + OA should reach $594,233 at 55. I believe without further contribution, if the aim is to ensure I can hit FRS, I should not have the problem. What if I did not meet the BRS, FRS at 55 or 65 years old? There are many people who believe the escalating BRS, FRS, ERS levels are negative goal post shifting. In my opinion, it is a bigger political nightmare if next time we all don’t have adequate money for the CPF Life annuity. There are many checks and restrictions in place such that you will have enough set aside, at least, for the BRS, currently about $80,000. You cannot have a longer term mortgage if you are close to 65 years old. If your property land lease is short, you are restricted severely to purchase it with CPF. Thus, the most likely reason you cannot meet the BRS, FRS at 55 years old is that you are self employed and have not voluntary contribute enough or that you earn so little that you will never hit the BRS. Essentially, self employed who are not financially sound are the most at risk. So are the low income folks. The low income folks may fall further and further away from the BRS, FRS. They would still get the CPF Life at 65 years old, but the monthly cash flow from the CPF Life annuity will be lesser. So its not like they will never see money from their CPF. The self employed folks need to be financially sound. This means they need to have wealth machine(s) out of the CPF. If they have, not meeting BRS and FRS is not catastrophic. Having a strong liquid net worth is more important than a strong CPF net worth. Compared to years ago, you will get the feeling how come CPF is in your face so much. There are road shows run very frequently. They appear on social media and they engage bloggers (like myself) to write about the narrative of the CPF. The communication team at the CPF are one of the most savvy and experienced when it comes to propagating the narrative, how they engage partners, finding ways to improve. Most likely, they are pretty well funded thus they could build up that competency versus other government communication teams. For me, this would not be possible if one of us didn’t decide to go crazy and throw a bunch of statistics, facts/half-truths in blogosphere. Over time, many would not remember Roy Ngerng, who wrote his content over at The Heart Truths. He wrote a bunch of very very long articles (by Kyith’s standards and likely other bloggers standards) that tries to show everyone there is more than meets the eye of your CPF. If you have not read about his content, do go over and read. Kyith advocate hearing both sides and then critically think about it. The whole of Singapore woke up to CPF. You have bloggers and commentators like myself trying to debunk some of the things he presented. It is likely you see the CPF and government communication team trying to scramble to combat these posts that is rapidly going viral. He wrote something, and then the nation had a conversation. You could agree with him, you could disagree with him. The aftermath is that there was a CPF Advisory Panel set up and recommendations was communicated to the people. The biggest result is that, a lot of these things you could do to improve your tax situations, fund your parents’/spouse CPF was there, yet not many of us knew about it. There were also a lot of nuances of the CPF that we gain more clarity easily nowadays. Without that social media and communication crisis, all these things couldn’t have happen. Essentially, a lot of good came out from that crisis. So if you find yourself knowing more about the CPF, remember that one individual decided to risk everything and go for the juguler. In my opinion, we should have thanked him for what he did. He created a fair number of jobs and revenue all by himself.